Jasper is known as an opaque variety of chalcedony, a microcrystalline form of quartz. Yes, jasper can be seen as quartz as well. However, its classification is still not easy. Due to the impurities found in jasper, it is more like a rock than mineral. The mineral content of the sediments it is formed in is responsible for the color of jasper. Sometimes it is red, and sometimes it varies from yellow to brown. Often times the minerals diffuses with each other and the rock is mixed with other minerals of different colors, which then form the swirls and lines found on jasper. Jasper is widely found, comprising of 12% of earth crust. The historical underpinnings, or Jasper importance, are “spotted or dotted stone” since Jasper in some cases, contains spots of dregs, fiery remains or mineral material. The significance of Jasper stems from the Old French word ‘jaspre’ or Latin ‘iaspidem’— which deciphers the distance back to its old Greek, Hebrew or Acadian roots. You may see that each piece of jasper is unique and different from the other one because of the organic material trapped inside it, which oxidizes to form a unique structural arrangement. The lines and swirls on jasper sometimes depict the sandy dune in a desert or a mountainous landscape. Jasper’s roots can be traced back to early Mesopotamian civilizations, where green and red jaspers were considered highly precious. Historically, Jasper can be traced back to almost all the ancient civilizations. Shamans wore it, and other kings and priests also used to wear it in form of an amulet. It was known to have protective powers against illness and evil. People believed it to protect them in this world and afterlife, which is why ancient Egyptians used to bury the dead with jasper, hoping it to help ease the transition afterlife. Talismans, rings, amulets and seals used to be engraved with jasper. In ancient Egypt, jasper was also considered as a symbol of motherhood and fertility. 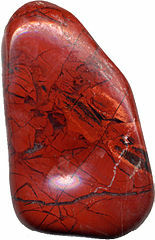 Red Indians believed jasper to promote health and aid in rebirth. It was known as the blood of the mother earth. In Viking and German legends, the handle of the mystical sword of Siegfried, the winged serpent slayer, was decorated with Red Jasper to provide him boldness and courage. Jasper is known for protection, physical endurance and strength. It is worn to keep the balance and to keep the person grounded. Jasper is known to activate the root chakra with its red color. Our root chakra is where the Chi energy resides and jasper is known to stimulate that energy and give a person stability and vitality. It has cleaning properties, which is why it is believed to eliminate the negative energies and clean the aura. It is used to curb aggression and heal infertility. While metaphysical benefit of jasper may be doubted, jasper makes a great stone to be carved and used to make earrings, rings and necklaces.